Health care providers distinguish bacterial and viral sinusitis by watchful waiting. If a person has had sinusitis for fewer than 10 days without the symptoms becoming worse, then the infection is presumed to be viral. 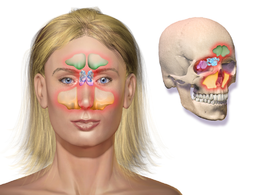 When symptoms last more than 10 days or get worse in that time, then the infection is considered bacterial sinusitis. Pain in the teeth and bad breath are also more indicative of bacterial disease. Imaging by either X-ray, CT or MRI is generally not recommended unless complications develop. Pain caused by sinusitis is sometimes confused for pain caused by pulpitis (toothache) of the maxillary teeth, and vice versa. Classically, the increased pain when tilting the head forwards separates sinusitis from pulpitis. ^ Ebell, MH; McKay, B; Dale, A; Guilbault, R; Ermias, Y (March 2019). "Accuracy of Signs and Symptoms for the Diagnosis of Acute Rhinosinusitis and Acute Bacterial Rhinosinusitis". Annals of Family Medicine. 17 (2): 164–172. doi:10.1370/afm.2354. PMC 6411403. PMID 30858261. ^ Falagas ME, Karageorgopoulos DE, Grammatikos AP, Matthaiou DK (February 2009). "Effectiveness and safety of short vs. long duration of antibiotic therapy for acute bacterial sinusitis: a meta-analysis of randomized trials". Br J Clin Pharmacol. 67 (2): 161–71. doi:10.1111/j.1365-2125.2008.03306.x. PMC 2670373. PMID 19154447. This page was last edited on 24 April 2019, at 04:35 (UTC).